I'm shocked. I actually hate the cartoon Oriole being on the hats and stuff. Much prefer the realistic looking oriole. Weird. How far does one have to drop to get Joe Posnanski to turn on you? Look: He is 33 years old, just beginning a $240 million contract, and he’s playing for an overpriced and kind of dreadful team that looks like it was built by a rotisserie baseball beginner who ran out at the last minute and bought three fantasy baseball magazines. He looks hurt. He looks tired. He looks out of place. He looks … well, truth is, who is even looking anymore? This is why losing Pujols didn't really bother me all that much. I would have liked him to retire a Cardinal, but that contract he signed with LA is is going to define him far more than it ever should. 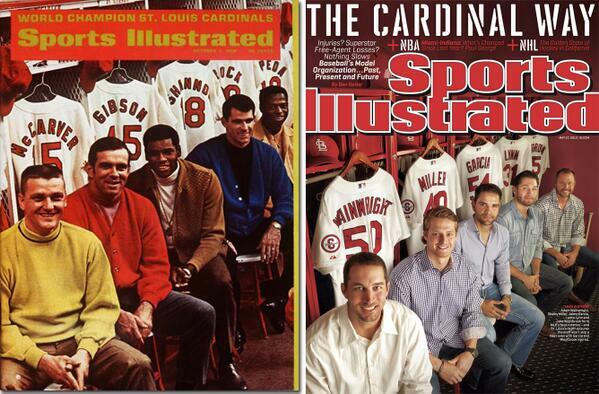 The Cardinals really wanted to go five or six years at the going rate. Ten was just a terrible price for a guy with a history of arm problems and plantar fasciitis. He was a workhorse, and played through lots of pain, it didn't take a rocket scientist to figure put that those same pains at 30+ was going to start really diminishing his production. Damn 6 game losing streak from the O's. Good news is that now that I'm living in Ohio my gf's parents are Indians fans and are always watching those games. Damn fine baseball games from the Indians this year. Part of the reason the Cardinals have the best record in baseball has been some amazing performances by their rookie pitchers. Going into the weekend, the six Cardinals rookie pitchers had combined to go 11-3 with a 2.34 ERA and 119 strikeouts in 115 innings. … Rookie Trevor Rosenthal is on pace to set a franchise record for best single-season strikeout rate by a reliever. Rosenthal is averaging 13.5 strikeouts per nine innings; the current mark is Mark Littell’s rate of 11.1 K’s per nine innings in 1978. They have bolstered a strong pitching staff, allowing it to weather the injuries to Carpenter and Motte to start the season, and Westbrook and Garcia in recent weeks. It's feeling like an October run is in the making. Speaking of Cardinals... I've had two people in the last week mistake my Louisville hat for a St Louis hat and start talking about baseball. Do they really not know the team logo? Of course I'm usually wearing both a hat and a shirt when I'm out so maybe they can't read. I'm from Baltimore, so I obviously love the uniform and the stadium... but I'm surprised by the orange and black winning. I guess going back to the white panel cartoon bird had something to do with it (it's been selling very well), but... it's 70's. Doesn't work now. Looks too retro. Fingers crossed they don't have to go to the bullpen early. Here we go again. 4-0 Rays in the 3rd. Not sure why the Yankees bother starting CC against the Rays. We did this to him just last month. No sh*t. I also picked him up and started him on my fantasy team to fully establish the jinx. Munenori Kawasaki is my favourite player, in any sport, and he should be yours too. He is one of the few good things about this abysmal season as far as Jays fans are concerned. Looks like the league might get Braun afterall... good! Things are about to get interesting. Braun going down is pretty much the best though. Does anyone know if there are clauses in player contracts which nullify them if they are found guilty of cheating? Yankees would love to get out of that ARod contract. The ARod deal was a farce the moment he signed it. A ten-year deal to a 33-year-old player? Steroids were the only way he might have performed up to the standards the Yankees expected. Not taking steroids was probably grounds for termination of the contract. There aren't clauses, the NHLPA would fight tooth & nail against that, but if the Yankees can prove that Rodriguez signed the contract under false pretenses then it can be voided. Sounds like Cabrera might be home free (as a semi-Blue Jay fan I hope this is the case) as he was already suspended. There's a good chance that this is where he acquired his PEDs. If you're not watching Rays-Sox on ESPN you should be. Top of the 11th, 8-8. Been a hell of a game. Boston scored 6 in the first, Rays came back to tie in the 9th. Boston scored 2 in the 10th, Rays answered in the bottom. And now Inning 13... and the Rays mascot has his pajamas on. EDIT: Crap, Boston up 10-8 in the 14th now. I think the Rays are out of pitchers. The best baseball highlight from last night. That .gif is a metaphor for being a Mets fans since 2006. Fitting that there's a Cardinal in the foreground. ....who just reached 50 wins first? "Somebody pays the price for that throughout baseball," Leyland said. "That's just the way baseball is. That's not free. There's no free lunch. That won't be tolerated. You can take that to the bank." Like Rodney is trying to hit someone in the 10th inning? That's just stupid backwards thinking. A night after Tigers manager Jim Leyland said he would "not tolerate" the type of brush-back pitch Rodney threw near Cabrera's head, Tigers starter Rick Porcello hit the Rays' Ben Zobrist with the first pitch in the first inning, greatly irritating Maddon. The manager called Porcello's actions "totally premeditated" and hoped out loud that the league would investigate, noting that the Rays had not actually struck a Tigers batter in the series. Maddon said he was "unimpressed" how Cabrera had escalated the situation on Saturday, noting that while he is an "outstanding" player, "I just wish he didn't cry so much." The mild-mannered Zobrist walked slowly to first base after being struck below the shoulder. Both benches were warned and there were no further incidents in the teams' last meeting this season. Zobrist agreed with Maddon on all counts, saying the umpiring crew "should have done something" about his being struck and adding, "for Cabrera being the best hitter in the world, he was a little sensitive last night." Said Leyland: "Nobody's trying to hit anybody. It's just part of the game." Good burn by Maddon though. And more importantly the Rays won 3-1, taking 2 of 3 in the series. f*ck Detroit. And the Birds sweep the Yankees. Wow is Houston really this awful? Rays win 12-0 last night, and now up 5-0 tonight in the 6th. No hitter for Homer Bailey! Last one of last season and the first of this season. Sometimes I just love baseball more than any other sport.